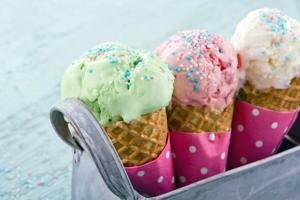 In the heat of the summer, there are few foods more enjoyable than ice cream. It's cool and refreshing, and most importantly, it comes in a variety of flavors and can be eaten in countless ways. Maybe you'll throw some rocky road on a cone or have a scoop of chocolate chip cookie dough in a dish. You might also partake in a few toppings, like sprinkles or hot fudge. As delicious as it will taste, you may also encounter some problems. Unfortunately, the warm weather food isn't actually made to withstand the high temperatures, which can leave an unwanted sticky mess, whether you have a cone or a bowl. Luckily, ice cream lovers everywhere may receive a solution to the melting problem from the beginning of the supply chain. When you think of the supply chain, you may consider stores, manufacturers and maybe even suppliers. However, one part of the workflow that you might forget is research. To make products as effective and enjoyable as possible, companies must put their items through a series of tests and make changes to improve their quality or durability. You don't want to give products to customers if the items aren't going to hold up to inspection. In ice cream manufacturing, you'll also have to taste test and solve one of life's biggest issues: How to make your dessert last longer. Whether from melting or freezer burn, the milky treat only lasts so long. However, researchers from the University of Edinburgh and the University of Dundee may have the answer to extending the life of your ice cream. Cait MacPhee, a professor of biological physics in Edinburgh, and Nicola Stanley-Wall, a principal investigator of molecular microbiology at Dundee, were studying the properties of a naturally occurring protein called bacterial surface layer A, or BslA, when they discovered that it had characteristics that would be useful in ice cream, CBS News explained. BslA sticks to fat and oil molecules and air bubbles, all of which can be found in the dairy-filled treat. The protein forms a protective shell to defend itself from foreign particles and elements. This same coating can also make ice cream last longer. "It can form this film between the interface of air and water," MacPhee told CBS News. "That instantly suggests it can stabilize air bubbles, which it does do. It also can stabilize a mixture of oil and water in exactly the same way. It also can coat solid surfaces. That combination of the three - having solid surfaces, having air bubbles and having oil and water mixtures - is the definition of ice cream." Along with slowing the melting process, the protein may also protect against freezer burn, which lowers the quality and taste of the ice cream. Without having to worry about the treat going bad, consumers will be able to enjoy the dessert much longer. MacPhee and Stanley-Wall aren't the only ones who have made innovative discoveries in frozen treats. Dairy Queen's Blizzard treats are so thick that they can be flipped upside down without falling out of the cup. Of course, that can only be done when you first receive it, as no ice cream is immune to eventual melting. Many locations of the restaurant serve Blizzards upside down to display the thickness of their soft-serve ice cream. Dairy Queen guards its recipe closely, but the smooth and thick quality of their ice cream may be attributed to the 5 percent of butterfat in it. This naturally occurring fat comes from milk and adds to the creaminess of the treat. According to New Hampshire Magazine contributor Susan Laughlin, butterfat is what makes the ice cream thick. However, too much of it can leave the dessert with a grainy texture. Dairy Queen may have found the perfect amount to include in its widely enjoyed treat. There is a lot of competition for the best ice cream in the U.S. If companies want to compete, they must do what they can to make their products fan favorites. Dairy Queen's thick recipe and MacPhee's and Stanley-Wall's newly discovered protein could aid in improving flavors.